Witnesses included Jim Griffin of OneHouse LLC, Will Hoyt of the TV Music License Committee, David Israelite representing the National Music Publishers Association, Lee Knife of the Digital Media Association (representing online music businesses like Apple, Amazon, and YouTube), country music songwriter Lee Thomas Miller, Michael O’Neill of performance rights organization BMI, and Neil Portnow of the Recording Academy. Rep. Darrell Issa (R-CA) humorously observed of the panel “each of you has a vested interest in some aspect of the status quo and each of you is railing against some part of the status quo.” Seems legit. Lee Thomas Miller, writer of hits for artists like Tim McGraw, emphasised the central role songwriters play, saying “What I make is the seed that fuels the entire music business” and described the increased pressure on his professional songwriter peers in Nashville. His proposed solution was fairly radical: eliminate compulsory licenses and consent decrees governing ASCAP & BMI. David Israelite of NMPA similarly was critical of compulsories, and warned against their expansion, and characterized the consent decrees as outdated, as did Bill O’Neill of BMI. 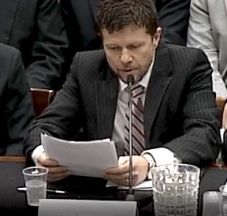 Jim Griffin focused his testimony on the need for a centralized registry/database of copyrighted works tied to global unique identifiers to better facilitate licensing and make it easier for creators to get paid. He noted that the lack of such a database means that unattributable incomes are being divvied up by market share, rather than reaching the creators. He further suggested that a market-based solution was possible to achieve without the government having to make huge investments of money and resources. Rep. Jeffries asked a potent question about who could potentially abuse the system in a “free market approach.” Lee Knife pointed to recent rate court decisions, and argued that direct deals (or government-backed emulations) would create inefficiencies. He pointed to film and television licensing as an example—both the composition and sound recording rights must be negotiated with all rightsholders, which he contended is a slow and laborious process. David Israelite of NMPA took a different view, pointing to YouTube, which is, by Israelite’s account, “completely licensed.” In fact, as Jim Griffin pointed out, YouTube is only “completely licensed” on the composition side as far as NMPA members are concerned—and not all songwriters are thrilled with the terms of that deal or the way monies are allocated. Griffin reiterated that, in the absence of a comprehensive database associating songs with the various rightsholders, there’s an abundance of music on YouTube for which the service has difficulty paying. There was plenty of talk about getting songwriters a “fair market value” for their work, but in the hearing’s final moments, Rep. Thomas Marino (R-PA) asked the witnesses to respond in writing to better describe the difference between a “fair market” and a “free market.” Indeed, this may be the crucial question for independent musicians and songwriters. With so much consolidation among major record labels, music publishers, AM/FM broadcasters and telecommunications companies, strictly free market approaches might work well for the most powerful players but disadvantage independents. At the very least, direct deals rarely achieve the kind of transparency and “fairness” that we’d like to see. Congress’s next hearing on music licensing happens on June 25—witnesses will include Darius Van Armen of indie label Jagjaguwar and singer/songwriter Roseanne Cash, among others. As always, we’ll be covering it live on Twitter.